Scouts Attention! Scout Sign, Scout Motto: “Be Prepared”, Are we prepared to take the Scout Law? “We are prepared”. A Scout is Trustworthy, Loyal, Helpful, Friendly, Courteous, Kind, Obedient, Cheerful, Thrifty, Brave, Clean and Reverent. These 12 words or points of the Scout Law are recited at every Boy Scout Troop 3 meeting to remind us on how we should live our lives to the best of our ability. Rod Kneen recited these words for more than 80 years and more importantly was a great example to generations of scouts as he lived those words. He was especially loyal, to his loving family, friends, his church and to his scout troop. To me, Rod Kneen was a scouting version of the character Forrest Gump, in that he seemed to be present for important events throughout the history of Scouting. Raised on upper Minerva Street he was only a short walk to the Derby United Methodist Church, which he attended with his family. The church has been the home of Cub Scout Pack 3 since 1927 and Pack 3 is the oldest Cub Scout Pack in America. Rod joined Pack 3 in 1932, just 2 years after Cubbing became an official program of the Boy Scouts of America. Rod also performed in his first Scout Minstrel in 1932 and has participated in them every year since, except for the 2 years he was serving his country in the Air Force Reserves during World War 2. The Minstrel, now a Scout Gang Show, is the longest running show of its kind and helps generate funds to run the Pack, Troop and Crew and assist scouts in attending the Edmund D. Strang Scout Reservation. In 1935, Rod joined Boy Scout Troop 3, sponsored by the Derby 2nd Congregational Church and he never left. His Scoutmaster was the late Edmund D. Strang, who became a lifelong friend and cohort. Rod spent many summers at Camp Irving on the Housatonic River, near the present Indian Well State Park, where he may or may not have been the lone bugler blowing middle of the night reveille. In 1937, Rod attended the very first National Scout Jamboree, which took place on the Mall in Washington DC, where he saw President Franklin Deleano Roosevelt, and Scouting founders James E. West and Daniel Carter Beard. In 1939, Rod was part of the Troop 3 contingent to camp at the World’s Fair in New York, where they served as Safety Monitors and through the RCA exhibit, he was able to witness the first public television broadcasts. Also in 1939, Rod was a charter member of Senior Troop 33, which became Explorer Post 33 and is now Venture Crew 33, sponsored by the Derby Shelton Rotary Club. In the early 1940s Rod was also instrumental in helping to form Scout Air Squadron 13, named for his brother Colonel George Kneen. 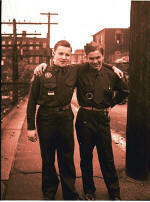 Upon returning from the war, Rod became Post 33’s Advisor, a position he held for more than 60 years. While Advisor he was coach of Post 33’s basketball team that included Shelton Board of Alderman President John Anglace, the late Sunnyside School Principal Frank Skoronski and Bob Skoronski, who went on to Captain the Superbowl Champion Green Bay Packer’s Football Team. In 1948, Rod shared the minstrel stage with the actor Brian Dennehy. Rod was in charge of receiving the donations from the troop alumni for the annual Minstrel and now Gang Show boosters and he loved receiving the little notes along with the donations from the generations of alumni. He was always a hit at the end of the shows as part of his brother-in-law Walter Petz’s “Beauties” or “Leftovers from the Easter Parade”. Who can forget in the late 1960s when he wore boots, flowered miniskirt, wig, hat, sunglasses and lipstick, holding the sign “Make Love, not war”. His biggest role in the show was as Stooge Director, for more than 60 years he worked with the explorers and crew members to perform run on one liners like “Big Dame Hunt” “Hawiia or Haviia” and of course the ever elusive “Mrs. Jones”. Even as of last year’s show, it was always a great honor to be selected as a Stooge to work with Rod. In the late 1950’s Rod was part of the group of volunteers to make weekend trips up to Goshen, Connecticut to help clear campsites for the newly established Housatonic Scout Reservation. Renamed in 1990 the Edmund D. Strang Scout Reservation, the scouting paradise continues to provide Scouts of the Valley with a premier summer camp program. Rod continued to support the camp through covering the cost for his son, Rod to install lightning rods on all of the camp structures. In 1969, Rod was one of the chaperones of Post 33’s first Europe Trip. Three weeks, seven countries, 40 scouts, what an adventure. This was the first of many big trips the Troop and Crew continue to make to expose the world to our scouts. Last year Troop 3 celebrated its 100th anniversary and Rod was on hand to help celebrate that milestone by assisting in installing a time capsule on the Derby Green. He also helped honor Dr. Sherwood Lewis, the late Charles Stankye Jr, Jim Florczak and myself with “3 for Life Awards”. It was quite fitting since we were all Explorers under Rod in the 1940s, 50s, 60s and 70s respectively. Rod was Troop 3’s 28th Eagle Scout and his love of Scouting had an impact on his family. His lovely wife Ruth was such a strong supporter of our scout groups. She was also involved in Girl Scouts with their daughter Robin. 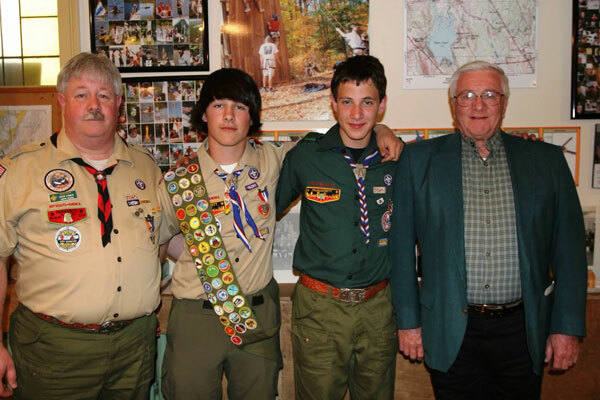 Rod’s son Boo is a Troop 3 Eagle Scout and grandson Jayson was a member of Pack 3 and Troop 3. Rod’s nephew Jim Connery is also a Troop 3 Eagle Scout and he also served as President of Housatonic Council BSA. Because of Rod, hundreds of Post 33 Explorers earned Eagle Scout Rank, including 21 in a single court of honor! Scouting is truly indebted to Rod’s family for sharing him with our Scouting family all of these years. Rod has been honored numerous times by the Boy Scouts of America for his outstanding service to Scouting. He earned the Housatonic Council President’s Award in 1971 and the Silver Beaver Award in 1972. He was honored with the Spurgeon Award for Exploring in 1973. Rod was presented with a James E. West Fellowship Award in 1999, when he was also honored with the “3 for Life” Award for his service to Troop 3. Rod was quite touched when he was notified last month that he was selected to receive the Housatonic Council Distinguished Eagle Scout Award on January 3rd. It should be no surprise that Rod was honored by the Valley United Way with the “Living Treasure” Award. He was certainly a good friend, a Good Scout, “3 for life” who lived the 12 points of the Scout Law and he was a living treasure to everyone in Pack 3, Troop 3, Crew 33 and Housatonic Council. DERBY –Walking the rope bridge, building a pine wood Derby car and jumping in the moon bounce are a few of the free activities being offered at the Derby Green on Saturday, Sept 26 from Noon to 3PM as part of Housatonic Council Boy Scout Troop 3 Derby’s annual Ed Strang Day. Representatives will be on hand to provide free membership registration to join Cub Scout Pack 3, Boy Scout Troop 3 and Venture Crew. For more information call 203 732 0343. DERBY – Twenty nine scouts, leaders and parents from Troop 3 and Venture Crew 33 Derby, recently returned from a two week adventure to Derby and London, England, where they stayed with host scout families, met the mayor, visited castles and attended an international scouting event with 7,000 other scouts. “It was a trip of a lifetime”, according to Troop 3 Senior Patrol Leader James Chopak. “We made loads of new friends, who we are still in contact with and I’m already planning my return to England”, Chopak added. Hosted by the families of the 107th Derby and Trent Explorer families, the scouts were treated to a Medieval banquet as well as a tour of the Derby Gaol, or jail, where author and ghost hunter Richard Felix discussed the jail’s history. Felix had previously visited Connecticut and Derby’s haunted Sterling Opera House, and he was very excited to meet fellow Derbyites from across the pond. Lord Lieutenant Willie Tucker (the Queen’s representative),left and Derby, England Mayor Paul Pegg met with the Troop 3/Crew 33 Derby, Connecticut and Derby, England scouts in the City Council Chamber, where Troop 3 Committee Member and Derby Alderman Felicia Monaco and Troop 3 Senior Patrol Leader James Chopak presented Mayor Pegg with a key to the city on behalf of Derby Mayor Anita Dugatto. The two Derby groups also encamped along with Scouting friends from the 25th Limerick, Ireland Troop at Peak2015, on the grounds of Chatsworth House, the estate of the Duke and Duchess of Devonshire. Peak is and international scouting event hosted every five years in the Peak District of England by the Derbyshire Scouts. Scouts from fifteen countries participated in activities that included caving, rappelling, wheelchair basketball, stilt walking, hoover craft and Segway riding. Several Derby scouts also met Bear Grylls, Chief Scout in the United Kingdom. While in London, in addition to touring the Tower of London, riding the London Eye, travelling by double-decker bus and the Underground, the scouts stayed at the Baden-Powell House, named for Lord Robert Baden-Powell, the founder of the Scouting movement. “We expect to continue our international exchange scout program next summer by sending our top scouts to Derby, England and Limerick, Ireland, while also hosting scouts from there” explained Richard Williams, Troop 3’s Committee Chairman. “This ongoing program allows the scouts to experience the world and expand our world Scouting friendships” Williams added. Troop 3’s Patrol Leader’s Council recently completed annual calendar planning and decided on the following monthly troop meeting and camping weekend themes: International Scouting, Circus Skills, Outdoor Scout skills, water activities, film/photography, Duty to God & country, Merit Badge College, Health/Fitness and games, climbing and trampoline. The scouts resume meeting 7PM Wednesdays beginning September 9th. The troop meets at their sponsoring organization since 1914, the Derby 2nd Congregational Church, on Elizabeth St. All young men ages 11 to 17 are encouraged to join in on the Scouting adventure. Call 203-732-0343 for more information. On September 26th Cub Scout Pack 3, Boy Scout Troop 3 and Venture Crew 33 will host their 21st annual Ed Strang Day on the Derby Green. Named for the late long-time Scouting pioneer and Derby Hall of Fame member, Edmund D. Strang, the free event for boys and girls will take place from noon to 3PM and includes a rope bridge, archery, craft making, face painting, model car building and racing as well as many circus related skills training. Boy Scout Troop 3’s year-long centennial celebration will culminate with a gala Oct. 26 at the Inn at Villa Bianca in Seymour. John Anglace, president of the Shelton Board of Aldermen, and a Troop 3 alum, will serve as chairman of the gala, and Eric H. Schultz, Harvard Pilgrim Health Care CEO, will be the keynote speaker. The troop is among the oldest Scout Troops in Connecticut. Founded by the Derby 2nd Congregational Church just 4 years after Scouting arrived in America, the troop continues to meet and be sponsored by the historic Elizabeth Street church. Troop 3 is unique in that although headquartered in Derby, its membership is composed of scouts and leaders from throughout the lower Naugatuck Valley area. Troop 3 Scouts, leaders and alumni will gather to reflect on 100 years of scouting success. Many local scouts have gone on to become successful in all walks of life. Consequently, many notables from the sports world, theater, medicine, military and other areas will be present to recognize scouting values, pay tribute to past leaders, and to help inspire today’s youth to reach their goals in life. Bob Skoronski, the legendary Superbowl I and II Green Bay Packer’s captain, is an alumnus of Troop 3. Keynote speaker Eric Schultz also was active in Derby based Cub Scout Pack 3, Boy Scout Troop 3 and Explorer Post 33 Derby, where he earned the rank of Eagle Scout. Schultz and his wife Kim have two grown sons – both Eagle Scouts. Schultz has been an active volunteer scouter as an adult, having served as President for Mohegan Council BSA in Massachusetts for three years and most recently he held the position as Area One President for the Northeast Region Boy Scouts of America. Schultz has also served on the training staff at the BSA’s Philmont Training Center in New Mexico. Schultz is a proud recipient of the National BSA’s Silver Beaver Award and he, along with his mentor, the late Edmund D. Strang, are the only Troop 3 Eagle Scouts to receive the National BSA’s Distinguished Eagle Scout Award. Schultz holds an MBA in Health Care Leadership from Yale University’s School of Management, as well as a bachelor of science degree in biology and a bachelor of arts degree in economics from the University of Connecticut. In 2009, he received an honorary doctoral degree from the Massachusetts College of Pharmacy and Health Sciences. With more than 25 years in the health care industry, he is currently the president and CEO of Harvard Pilgrim Health Care, a health plan spanning across Maine, New Hampshire, Massachusetts and Connecticut. He and his wife live in Boston, Mass. Troop 3 was founded by the late Rev. Alfred Budd, who served as scoutmaster until 1935, when the late Edmund Strang, who was serving as cubmaster of Pack 3, also became scoutmaster of Troop 3. Strang, who was involved in Scouting from 1922 until his death in 1995, served as scoutmaster for 25 years. The late George Tierney Sr. followed Strang, serving 15 years and was followed by the late Larry Potter Jr, Andrew Kopasz, Bruce Sill and the late Robert Penney. Randy Ritter served as scoutmaster from 1987 until 2002, when Jim Frovarp assumed leadership of the Troop. Frovarp was succeeded by Jason Thompson in 2004, serving until 2006 when Ritter returned as scoutmaster and continues to serve in that position. There are more than 40 members of the Troop 3 committee with many years of service, including Rodman Kneen of Shelton, who has 82 continuous years in Scouting. Reservations for the Oct. 26 dinner can be made by calling Raymond Oppel at 203-929-6616 (daytime) or 203-929-7210 (evenings), or by e-mail, ray.oppel.cpa@sbcglobal.net. Dr. Sherwood Lewis recalls his most wonderful times as a youth were spent camping with Boy Scout Troop 3 Derby at Camp Irving on the Housatonic River and at Camp Workcoeman, in New Hartford, where he eventually served on summer camp staff. Although more than 60 years have passed, these memories of camping and the dedicated scouting leaders like Rodman Kneen and the late Ed Strang and Walter Petz have been the driving force to continue his involvement and support of Boy Scout Troop 3. Troop 3 is honoring Dr. Lewis at their 100th anniversary celebration on October 26, with the “3 for Life” Award, a special honor reserved for alumni who excel in their field and have had a lifelong commitment to Scouting. Rodman Kneen, Sr. of Shelton, his 91 year old former leader who is still active with the troop, will present the award. After becoming Troop 3’s 27th Eagle Scout in 1948, and graduating from Derby public schools, Dr. Lewis received a B.A. degree with honors and an M.S. degree in microbiology from the University of Connecticut. He subsequently earned a Ph.D. in molecular biology from Brandeis University. During 1963–1964 he was a senior scientist in the Space and Life Systems Division of United Technologies Corporation. This was followed by a thirty year career as Director of Clinical Chemistry and Toxicology in the Department of Pathology and Laboratory Medicine at St. Francis Hospital and Medical Center in Hartford, CT.
Dr. Lewis, 2nd row, far right, 1948. Upon retiring from St. Francis he embarked upon a different career, becoming Director of Toxicology at the Office of the Chief Medical Examiner, State of Connecticut in Farmington, CT. Although now officially retired, Dr. Lewis has continuously held academic appointments at the University of Connecticut Health Center. He was a Visiting Professor at Trinity College, Hartford, CT and at the College of Medicine and Allied Health Sciences, University of Sierra Leone in Freetown, Sierra Leone, Africa (in part this opportunity to teach in Sierra Leone came about because he had been awarded the 1990 International Travel Award by the Association for Clinical Chemistry). Dr. Lewis continually shares his knowledge and interests with others outside of his own laboratories and institutions. He has served on various panels and committees, from the U.S. Food and Drug Administration to the Connecticut State Department of Health Services and Department of Higher Education. He uses these opportunities to promote the best of clinical chemistry for the betterment of people’s lives. Dr. Lewis and his wife Gwendolyn reside in Bloomfield. “We are indeed thrilled to be able to honor Sherwood with the 3 for Life Award,” stated John Anglace, a Troop 3 Committeeman and the 100th anniversary dinner chairman. “As a contemporary of Sherwood’s, I cannot think of a more deserving recipient for all he has done in participating in Troop 3 functions and helping send deserving scouts to the Edmund D. Strang Scout Reservation each Summer,” Anglace said. If your last name is Stankye and you grew up in Derby, chances are you were involved in Housatonic Council Boy Scout Troop 3. Charles M. Stankye, Jr. is the patriarch of the Derby Stankyes and by his example has instilled in his family a lifelong commitment to Scouting. Charlie will be recognized by Boy Scout Troop 3 for more than 70 years in Scouting on Oct 26 at Troop 3’s 100th anniversary celebration at Villa Bianca in Seymour. The troop is sponsored by the Derby 2nd Congregational Church, where it was founded in 1914, and continues to meet there. Stankye will be receiving the “3 for Life” award, presented every 5 years by the Troop to alumni who have been outstanding in their commitment and support of Cub Scout Pack 3, Boy Scout Troop 3 and Venture Crew 33. Previous recipients include the late Scouting pioneer, Edmund D. Strang, Walter R. Archer, Jr, the late Walter Petz, Robert Bednarcik, the late Charles Rotteck, Jr, Rev. John Carr, former Ansonia Mayor Bill Menna, the late Christy Testone, the late Anthony Pepe, Superbowl 1 & 2 Green Bay Packer’s Captain Bob Skoronski, the late Frank Skoronski, Dr. Robert Feeney, Shelton Aldermanic President and 100th anniversary dinner chairman John Anglace, Jr. and Rodman Kneen, who has been involved in Scouting for 82 years. Joining Stankye at the dinner as latest “3 for Life” recipients will be Dr. Sherwood Lewis and James Florczak. Charlie Stankye, Troop 3’s 34th Eagle Scout, started his scouting career in 1942 when he became a Cub Scout in Pack 3 under legendary Cubmaster Edmund D. Strang. Charlie continued on to become a Boy Scout in Troop 3 in 1945. While a scout in Troop 3, Charlie served as a Den Chief and was Patrol Leader of the East Derby Beaver patrol. Charlie continued on to become a member of Explorer Post 33, where he served as Post Scribe and Post Guide. While a member of Troop 3 and Post 33 Charlie performed in the Annual Minstrel Shows as a soloist and endman. In 1950, Charlie attended the National Scout Jamboree in Valley Forge, PA, where he worked at the Trading Post. He was also on summer camp staff at Camp Workcoeman, in New Hartford, CT. 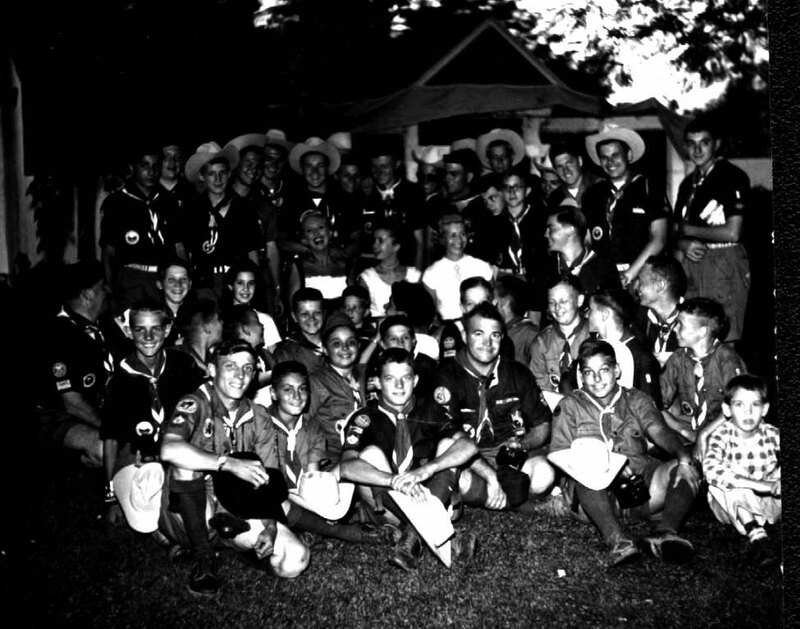 In 1953, along with other scouts from Troop 3 and Post 33, Charlie traveled by train to Irvine, CA to attend the National Scout Jamboree. While at the Jamboree, Charlie and the other scouts had the opportunity to meet with Danny Thomas and Debbie Reynolds. The highlight of the trip was when the scouts of Troop 3 made national headlines after a private meeting with Mitzie Gaynor. Several of the Scouts including Charlie, got to have their pictures taken with her. As an adult, Charlie continued his scouting career. He joined the executive Board of the Housatonic Council and served on the board for 15 years. While on the board Charlie served as Council Treasurer, Vice President and President. During his term as President, the Council renamed and dedicated its camp, Housatonic Scout Reservation in Goshen after long time Scouter, Edmund D. Strang. Charlie was awarded the Silver Beaver by the Housatonic Council. He was also awarded the Bronze Pelican by the Archdiocese Catholic Committee. Charlie is also a recipient of the Valley Chamber of Commerce’s Gold Seal Award. Charlie continued his volunteer service to the community outside of Scouting. Charlie has been very active in the fire service not only in Derby; but throughout the State of Connecticut. He has been a member of the Paugassett Hook & Ladder Company #4 of the Derby Fire Department for 60 years. As a member of the Paugassetts; Charlie served as a Lieutenant and Captain. He was the Company Secretary for 20 years. Charlie eventually rose through the ranks of the Derby Fire Department as Asst. Fire Chief and became Chief of the Derby Fire Department where he served for 8 years. In 1975 Charlie became Deputy Fire Marshal and has served in that capacity for the past 35 years. Charlie is a Past president of the Valley Fire Chief’s Association and currently serves as the Association’s Treasurer. He is also on the Board of Directors of the Valley Fire Chief’s Regional Fire Training School and serves as its Treasurer. He is also a member of the building committee of the new regional fire school. Charlie is a Past President and the current Treasurer of the Connecticut State Firefighters Association. In 2011 Charlie was inducted into the Connecticut State Firefighter’s Association Hall of Fame. In 1999 Charlie was appointed by then Governor John Rowland to the Commission on Fire Prevention & Control; where he still serves. Charlie serves on the Board of Directors of the Derby Public Library and is a Past President of the Board. Charlie is retired from the New England Engineering Company and the Hancock Engineering Company. He has been married to Anne Francione for the past 57 years. Anne has also been involved with Cub Scout Pack 3 for more than 45 years. Charlie and Anne have 4 children and 11 grandchildren. Charlie’s 3 sons --- Charles, III, Ronald and Richard are all Troop 3 Eagle Scouts. Grandsons Charles IV, Tyler and Timothy Stankye are Troop 3 Eagle Scouts and Zachary Geffert earned Eagle Scout Rank with Troop 1 Oxford. Ryan Stankye, of Washington state, is a fifth grandson very close to completing Eagle Scout rank. Charlie’s brother-in-law Thomas Francione is Troop 3s 51st Eagle Scout. “Charlies Stankye was an obvious choice when we were deciding honorees for this year’s “3 for Life” award.” Stated Richard Williams, Troop 3’s Committee Chairman. “As the patriarch of an 8-Eagle Scout family that has been part of Troop 3 for more than 70 years, his community service alone is a model for us all”, Williams added. All Troop 3 alumni and friends are invited to the 100th anniversary dinner at noon on Oct. 26, at the Inn at Villa Bianca in Seymour. Reservations are required and can be made by calling Raymond Oppel at 203-929-6616 (daytime) or 203-929-7210 (evenings). DERBY – Calling all boys and girls of the Valley! Archery, rope bridge and ice cream making are a few of the free activities to be offered at the Derby Green on Saturday, Sept 27 from Noon to 3PM as part of Housatonic Council Boy Scout Troop 3’s 20th annual Ed Strang Day. The event has been held annually since 1994, when the city of Derby welcomed home actor Brian Dennehy to honor Scouting pioneer Edmund D. Strang, Dennehy’s former Cubmaster. Additional activities including pinewood Derby racing, obstacle course, scavenger hunt and a fireman’s challenge will be offered to boys and girls to introduce them to the adventures of Scouting. A flag retirement ceremony will begin at noon. The public is invited to bring to the ceremony any flags in a condition no longer fit for displaying. A time capsule will be buried on the Derby Green to commemorate Troop 3’s 100th anniversary. Founded by the Derby 2nd Congregational Church in 1914, the troop continues to be sponsored by and meets at the Elizabeth St. church on Wednesdays at 7PM. Additional 100th anniversary events include an Alumni Minstrel & Gang Show on October 25 and an celebratory dinner at Villa Bianca on October 26. All alumni and friends of Troop 3 are invited to attend. Representatives will be on hand to provide information for free membership to Cub Scout Pack 3, Boy Scout Troop 3 and Venture Crew 33 will be available to all eligible youths who complete an application with a parent or guardian present. Assistance is also available for providing Scout uniforms. Current Scouts from throughout the Naugatuck Valley are also invited to attend in uniform and participate in the free activities. The event concludes at the Derby 2nd Congregational Church at 4PM with the awarding of Eagle Scout Rank to Troop 3 Scouts Anthony Bartholomew and Colby McLiverty.